You need to have your back pack weigh no more than 1/4 of your body weight. It should be a proper pack that will rest on your hip bones. 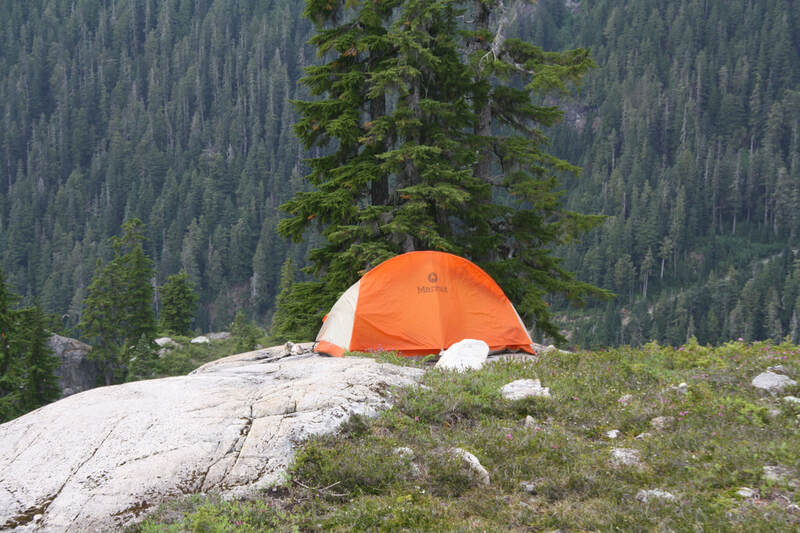 A sleeping bag should be light and in pack sack. You'll need a sleeping pad. A tent should also be lightweight and easily to put together. A Pocket Rocket is great to take in the back-country. It's compact and reasonably priced. A pot set with fork & bowl and gas are a few other items you will need in your pack. Your key is lightweight and pieces that pack together giving you more room. You will pass Squamish and will see a mall on your right with Starbucks, Subway etc. and sign saying 16 km to Garibaldi. Your next sign will say 2 km and the after that will say 2 km again and there will be a road, turn right. If pass this and see a dam on your right you have gone too far. Find a safe place to turn around and head up the road. If cars are parked along the side of the road you might want to find parking as it is not a turn around lot, you will have to back out. There are forms at the enter to the trail to fill out for over night stays. Fill out the forms and put the money inside and leave it in the lock box. Part of the form goes on your dash and part stays with you for your back country pass. There are pit toilets in the parking lot and the next time you will see pit toilets are at Taylor Meadows campground (8.5 km in) or at the lake (9 km in). Leave nothing in your car as these lots are often scoped and car windows are smashed for valuables; even ones in the trunk. You will start your hike at Rubble Creek/Black Tusk parking lot. Up, up you go with lots of & long short switchbacks. The trails are wide, dusty for the first 6.5 Km's. I enjoy the walk in nature in my own comfortable thoughts. As you come to 6.5 km you are at a junction. Going left takes you through Taylor Meadows (I recommend it either on the way in or out, it's beautiful with views of The Black Tusk, 360 degree mountain views all around. In the summer flowers dance through the meadows. If you decide to skip the meadows and go straight you will have some rolling hills. Shortly after the junction, you will come to view point. Make sure you walk right down the skinny path as it takes you to a rocky outcrop with valley views and little Chipmunks. You will then come to two lakes that are quite blue and soon after to another junction. Going right takes you to the lake and campground, going left takes you up to Taylor Meadows. Head down to the lake, across the bridge and around to the picnic table and first of three huts. You can camp here or keep walking along the path. If you go closer to the ranger station it's quieter, the toilets smell nicer, there's a wharf to lie on and jump off into the glacier fed waters. 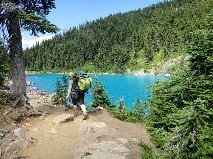 It is best to plan for several nights and do a day hike to Helm Creek, Panorama Ridge or the lookout &/or The Black Tusk. You must store your food hanging up in the huts. When you are ready to leave don't forget to take your garbage back out with you. Expect to have blistered feet and lots of mosquito bites, amazing pictures, meet really cool people. Have a great time. Happy & safe trails.